This is what a take out container looks like after you get it caught in your front wheel while riding. Hah, that's great. At least you didn't wreck. Then your jacket would look like that too. 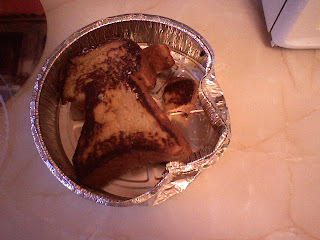 And happily, french toast is flexible. Does this mean your wheel problem is repaired? Gene thinks he saw your pink tires on 202 the other day. Were you with them? Just the tires? Not the rest of the bike? Yes, I was on 202 the other day, with my wheels! And yeah, Wendy fixed my wheel. David gave it a good effort though. Now I'm thinking about a new wheelset. I'm toying with the idea of offering bike cleaning services to make the money to splurge on a fancy new set...hmmm...people are just crazy for the q-tip service! For the record, I'm the one pushing her to start the bike cleaning biz. I think she could offer a detailing service for a good $50 and have lots of people who want a sparkling bike head to toe. And you utterly need a new wheelset, yours is shite. "Jenni's Bike Cleaning Biz- I'm strong enough to disassemble cassettes wtih my bare hands"